Monthly wall calendar offers ample space for scheduling your month. Dated planning pages range 12 months from January to December. The one-page-per-month format includes ruled daily blocks, Sunday-through-Saturday scheduling, moon phases, numbered weeks, moon phases, shaded weekends, count of days/days remaining, holidays, and full-year calendar reference. The current reference month is shaded for quick identification. 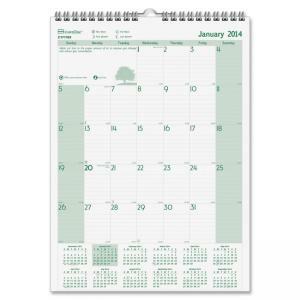 Wall calendar also features reinforced chipboard backing and twin-wire binding with an eyelet for easy hanging. Paper is made from a high percentage of recycled post-consumer material.